Close your eyes and imagine Led Zeppelin going for beers and tapas in Alameda de Hércules, Seville. Fantasize about Tommy Iommi in the small hours together with the first formation of Veneno. Think The Stooges drunk on sherry. Ok, now open your eyes. You don’t have to imagine anymore because all of this ...exists now. And with a name that you would never have come up with in a month of Sundays: Derby Motoreta’s Burrito Kachimba. Psychedelic highs, southern boho, stoner languor, carnivalesque garage, glam eyeliner, quinquiexploitation videos... 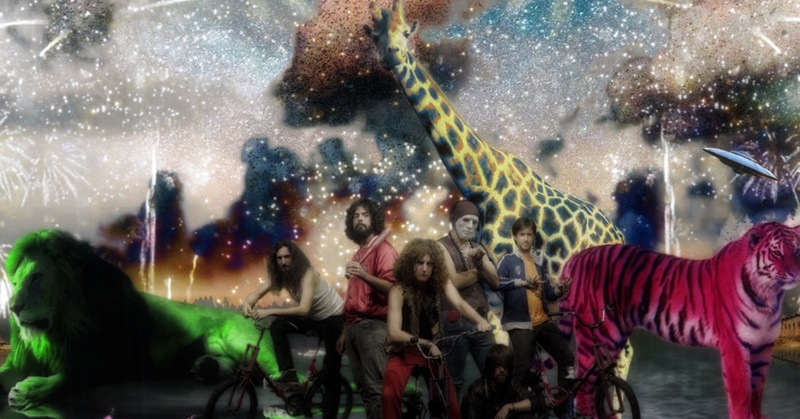 If this gazpacho rock manages to avoid being a nutty project by and for freaks it is because the members of this six-piece band have really done their homework (they played in The Milkyway Express, Quentin Gas y Los Zíngaros, Furia Trinidad and Jambalayaband). The stage presence of these Estos King Gizzard & the Lizard Wizard from Guadalquivir is that of veterans from the 70s. In fact, are you sure that DMBK didn’t exist in the 70s?